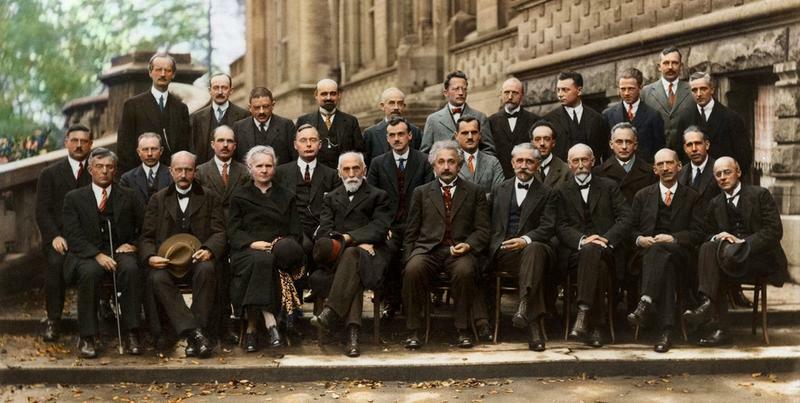 The Solvay Conference was founded in 1912 by Belgian industrialist Ernest Solvay. It was considered a turning point in the physics world. Held in Brussels, the conferences were devoted to preeminent open problems in both physics and chemistry. 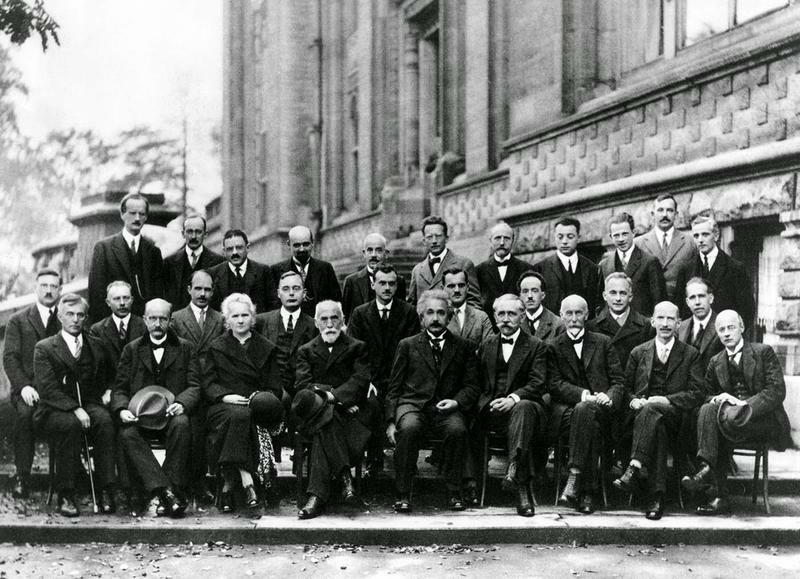 The most famous conference was the October 1927 Fifth Solvay International Conference on Electrons and Photons where the world’s most notable physicists, including Albert Einstein and Niels Bohr, met to discuss the newly formulated quantum theory. Einstein, disenchanted with Heisenberg’s uncertainty principle, remarked “God does not play dice”. Bohr replied: “Einstein, stop telling God what to do”. 17 of the 29 attendees were or became Nobel Prize winners, including Marie Curie, who alone among them, had won Nobel Prizes in two separate scientific disciplines. This conference was also the culmination of the struggle between Einstein and the scientific realists, who wanted strict rules of scientific method as laid out by Charles Peirce and Karl Popper, versus Bohr and the instrumentalists, who wanted looser rules based on outcomes. Starting at this point, the instrumentalists won, instrumentalism having been seen as the norm ever since. Back: Auguste Piccard, Émile Henriot, Paul Ehrenfest, Édouard Herzen, Théophile de Donder, Erwin Schrödinger, JE Verschaffelt, Wolfgang Pauli, Werner Heisenberg, Ralph Fowler, Léon Brillouin. Middle: Peter Debye, Martin Knudsen, William Lawrence Bragg, Hendrik Anthony Kramers, Paul Dirac, Arthur Compton, Louis de Broglie, Max Born, Niels Bohr. Front: Irving Langmuir, Max Planck, Marie Curie, Hendrik Lorentz, Albert Einstein, Paul Langevin, Charles-Eugène Guye, CTR Wilson, Owen Richardson. Auguste Piccard designed ships to explore the upper stratosphere and the deep seas (bathyscaphe, 1948). Emile Henriot detected the natural radioactivity of potassium and rubidium. He made ultracentrifuges possible and pioneered the electron microscope. Paul Ehrenfest remarked (in 1909) that Special Relativity makes the rim of a spinning disk shrink but not its diameter. This contradiction with Euclidean geometry inspired Einstein’s General Relativity. Ehrenfest was a great teacher and a pioneer of quantum theory. Edouard Herzen is one of only 7 people who participated in the two Solvay conferences of 1911 and 1927. He played a leading role in the development of physics and chemistry during the twentieth century. Théophile de Donder defined chemical affinity in terms of the change in the free enthalpy. He founded the thermodynamics of irreversible processes, which led his student Ilya Prigogine (1917-2006) to a Nobel prize. Erwin Schrödinger matched observed quantum behavior with the properties of a continuous nonrelativistic wave obeying the Schrödinger Equation. In 1935, he challenged the Copenhagen Interpretation, with the famous tale of Schrödinger’s cat. He shared the nobel prize with Dirac. Jules Emile Verschaffelt, the Flemish physicist, got his doctorate under Kamerlingh Onnes in 1899. Werner Heisenberg replaced Bohr’s semi-classical orbits by a new quantum logic which became known as matrix mechanics (with the help of Born and Jordan). The relevant noncommutativity entails Heisenberg’s uncertainty principle. Sir Ralph Howard Fowler supervised 15 FRS and 3 Nobel laureates. In 1923, he introduced Dirac to quantum theory. Léon Nicolas Brillouin practically invented solid state physics (Brillouin zones) and helped develop the technology that became the computers we use today. Peter Debye pioneered the use of dipole moments for asymmetrical molecules and extended Einstein’s theory of specific heat to low temperatures by including low-energy phonons. Martin Knudsen revived Maxwell’s kinetic theory of gases, especially at low pressure: Knudsen flow, Knudsen number etc. William Lawrence Bragg was awarded the Nobel prize for physics jointly with his father Sir William Henry Bragg for their work on the analysis of the structure of crystals using X-ray diffraction. Hendrik Kramers was the first foreign scholar to seek out Niels Bohr. He became his assistant and helped develop what became known as Bohr’s Institute, where he worked on dispersion theory. Paul Dirac came up with the formalism on which quantum mechanics is now based. In 1928, he discovered a relativistic wave function for the electron which predicted the existence of antimatter, before it was actually observed. Arthur Holly Compton figured that X-rays collide with electrons as if they were relativistic particles, so their frequency shifts according to the angle of deflection (Compton scattering). Louis de Broglie discovered that any particle has wavelike properties, with a wavelength inversely proportional to its momentum (this helps justify Schrödinger’s equation). Max Born’s probabilistic interpretation of Schrödinger’s wave function ended determinism in physics but provided a firm ground for quantum theory. Irving Langmuir was an American chemist and physicist. His most noted publication was the famous 1919 article “The Arrangement of Electrons in Atoms and Molecules”. Max Planck originated quantum theory, which won him the Nobel Prize in Physics in 1918. He proposed that exchanges of energy only occur in discrete lumps, which he dubbed quanta. Niels Bohr started the quantum revolution with a model where the orbital angular momentum of an electron only has discrete values. He spearheaded the Copenhagen Interpretation which holds that quantum phenomena are inherently probabilistic. Marie Curie was the first woman to earn a Nobel prize and the first person to earn two. In 1898, she isolated two new elements (polonium and radium) by tracking their ionizing radiation, using the electrometer of Jacques and Pierre Curie. Hendrik Lorentz discovered and gave theoretical explanation of the Zeeman effect. He also derived the transformation equations subsequently used by Albert Einstein to describe space and time. Albert Einstein developed the general theory of relativity, one of the two pillars of modern physics (alongside quantum mechanics).He is best known in popular culture for his mass–energy equivalence formula (which has been dubbed “the world’s most famous equation”). He received the 1921 Nobel Prize in Physics “for his services to theoretical physics, and especially for his discovery of the law of the photoelectric effect”. Paul Langevin developed Langevin dynamics and the Langevin equation. He had a love affair with Marie Curie. Charles-Eugène Guye was a professor of Physics at the University of Geneva. For Guye, any phenomenon could only exist at certain observation scales. Charles Thomson Rees Wilson reproduced cloud formation in a box. Ultimately, in 1911, supersaturated dust-free ion-free air was seen to condense along the tracks of ionizing particles. The Wilson cloud chamber detector was born. Sir Owen Willans Richardson won the Nobel Prize in Physics in 1928 for his work on thermionic emission, which led to Richardson’s Law.